Allison Sheehan Racing :: Hightower delivers. 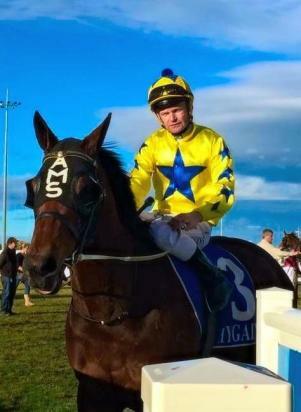 What great form Sergeant Hightower has been in of late and at Pakenham last Tuesday he recorded his most impressive victory yet, racing away to salute by a soft 1 3/4 lengths in a BM58 event over 1000m. Doing a great job dropping back from 1300m and conceding the rest of the field weight (carrying a hefty 61kg), Sergeant Hightower settled well for Brian Higgins and really let go over the final stages. "Back to 1000m I thought they'd be a bit nippy for him," Higgins said. "But he was nice and fresh today so he was able to take up a good positive spot." "He can be get there a bit soon sometimes and have a think about it but today he was convincing." Higgins added that he was not concerned about the 61kg, noting that "he is such a big horse who can carry weight quite well." "No doubt he will have to go up a notch but he is in great form and I'm sure with Allison's expertise she will place him to advantage." "It was great to get him across the line again," Allison said. "He has been performing so well throughout his preparation and has had 16 runs this time in." "And it is lovely to win for this group of owners who have been with me for almost ten years." One of whom - Bryan Cain - named Sergeant Hightower after the big goofy Police Academy character. A son of Churchill Downs, Sergeant Hightower was purchased by Bryan at the 2012 Inglis Autumn Yearling Sale. Bred by Greta West Stud, he is a full brother to the city winner Purple Storm and a half to the multiple metropolitan winner Two Hills. It has been a great season for the stable and we thank all of our loyal owners - old and new - for their support. From just 44 runners over 2015/16 we saddled up 11 winners... a 25% strike rate that we are exceptionally proud of. Stable star Andrassy led the way, winning five races and progressing from BM64 class to open mares at Caulfield last Saturday. "Her wins at Caulfield and Moonee Valley and on Cranbourne Cup Day were great highlights for us," Allison said, justifiably proud of the home-bred mare. "Getting Sergeant Hightower into such consistent form has been wonderful as well," said Allison. Allison continues to earn the respect of her racing peers, making the most of her opportunities with just eight horses in work. "She's got a good strike rate," noted jockey Brian Higgins. "She sends her horses out fit and places them well."